Flipping through a local newspaper recently, and this ad just kind of jumps out at me. 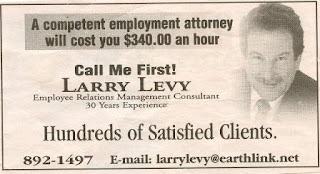 So call him because he's not a competent employment attorney. Is it just me or does this ad make him seem...what's the word I'm searching for...incompetent? If he did, in fact, use an ad agency to create this ad, he might want to consider using a competent one next time around. You should send this in to Jay Leno! that's hilarious and so unfortunately true. doesn't he look like the poster child for the "hair club?"